In some cultures especially in Nigeria, this is not a subject for discourse as nursing mothers can be seen tending to their children in really public places. But even in places like this, some women still find it hard to publicly breastfeed. · Remember that there are no laws in many countries banning women from publicly breastfeeding, so if you feel comfortable with baring it out, please do. 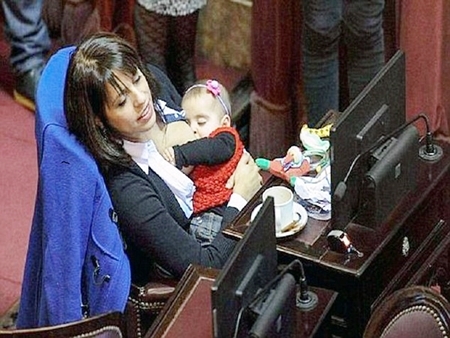 An Argentinian lawmaker did in the parliament house recently and she was lauded for it. · There are different nursing clothes and underwear that unhooks easily that makes breastfeeding a whole lot easier. These clothing also cover the major part of a woman’s breast. Get yourself some of these. · Express milk in a bottle for when you are out. I resulted to this after that encounter and it worked. I know we were told latching on to the breast while feeding increases the secretion of oxytocin which is the hormone that strengthens the bond between mother and child. But the little moments when it is not comfortable to latch on, a bottle can serve as a good option. Just express the milk and you are good to go. · Try and feed your child very well before you leave the house. This can sustain the child for a while and if you are not away from the house for a long period, you might not have to breastfeed outside. · It is nothing to be embarrassed about, it is a natural call. If you feel the need to breastfeed in a public place and you don't feel comfortable whipping it all out,then ask the attendants of the place if they have a breastfeeding room or a private place where you can get your business done.Most public places have such places now. Do you have other suggestions,kindly share. let us all learn together. Cheers.